I frequently have been asked in the years since Sawdust and Cider; A History of Lorane, Oregon and the Siuslaw Valley was published whether I would consider writing a sequel at some point. I have always said that I would like to, because I thoroughly enjoyed writing the original with the help of Nancy O’Hearn and Marna Hing. But, my life is full of other activities–mainly grandchildren and my job–right now, and I’m not sure that I would have the time to do a proper job of writing another book at this point. Instead, I would like to start a newsletter. It will include bits of history that have not been covered in Sawdust…, interviews with interesting residents of the community, features on new families and businesses in the area, activity announcements, school news, editorial comments, and yes, even letters to the editor. In order to make this newsletter a success, however, I will need to get input and written contributions from members of the community. There are questionnaires available at the Lorane Family Store that I would like each family in Lorane to fill out. For those who have lived in the area for more than a year, I’d like you to complete the Family Portraits/Portraits form; for those new to the area, there is the New Kids on the Block form; and for those who are conducting a business in Lorane, I would like you to complete the It’s Our Business form. All submissions and forms should be returned to the store. Since this is a beginning project, I will print newsletters as often as I have the material to include. My goal is to publish it at least monthly…and who knows, maybe at some point we can do it weekly. This issue will be free. I ask, however, that you take only one per family. You may xerox them if you like. Future editions will have a nominal charge to cover printing costs and, if applicable, postage costs. The purpose, for me, is not to make a profit, but to regain touch with my friends and community members whom I don’t see or talk to often enough, and to keep our area’s history alive for future generations. Where we go from here depends on how The Lorane Historian is received by the community. I hope that you will support this project with your suggestions and written contributions. In doing so, we will all benefit. Editor’s note: Maxwell Doty is the grandson of Reuben Doty who settled in the Lorane area in approximately 1874. Excerpts of a letter he wrote to me in 1990 remarking on information contained in our book, Sawdust & Cider; A History of Lorane, Oregon and the Siuslaw Valley make up this article. The Ford truck you may speak of as being used for picnic trips down to Siuslaw Falls was driven into a garage area under (the) roadside (at the) south end of the store. A stairs under a big trap door in the store floor led to it. Blaine used to drive it to Eugene every Tuesday for supplies for the store, etc. The W.W. Jackson home is the big white house to the right of the store (see lowest photo opposite introduction page in “Sawdust”), and in between, the oil house and outhouse (together) where the fire probably started. A trelise-covered walkway, passing in front of the oil house, connected the house to the store. The trelise was covered either with lilac or wisteria and, before the 1932 fire, my mother brought and planted cuttings of them on a trelise on the front of our farm house out west of Eugene. This photo must have been taken some years before Blaine and Maude’s bungalow was built still further to the right. When W.W. Jackson died, Blaine Addison took over the store and operated it. At that time, I believe he moved his family from the bungalow to the big white house. It was during this time that Della Jackson (Mrs. W.W.) came to live with us out west Eleventh Street, ca 5 miles west of Eugene’s Chambers Street. This was on the Crow Stage mail route. Della Jackson also lived in an apartment in Eugene sometimes, I believe providing a home for various of the younger generation going on to school. The related Abbey family was close to us too in later years. “Old Aunt Lib” stayed with us on her perennial rounds of the family: a delightful soul. To me, the great fire draws a close to an era in Lorane History. I clearly remember Blaine Addison coming to our house and telling Della Jackson and the rest of us that the store and house had burned down. It was, as you say, about two weeks before Christmas, 1932. This led to terminating the family’s use of that land between the three main roads. With my two Addison cousins, we defied superstition and climbed those stairs of what must have been the Modern Woodman of the World lodge building and saw that wooden goat with a wagon-like tongue sticking out its back end and rubber-tired wheels, one on each side. We were scared. One of your contributor’s tells us that Modern Woodsman initiates had to ride it. Incidentally, a “fresno” was such as you describe, but the guy on the handle raised the handle to get it to dig into the ground, and the handle was raised still further to get it to dig in, flip forward, and dump the dirt out ahead of itself. The team pulling it then dragged the fresno back for another load. The fresno jockey (me, many times) would try to flip the fresno back over quickly enough (via a trailing rope on the end of the handle) so the front sharp end would not dig into the ground and the fresno would drag with its sharpened end pointing slightly upward and not digging in as it was dragged back for another load. Handling the fresno was an art—practical art, for if it was not done just right, the guy practicing the art could be flipped over, too. For Jim Edwards for finishing the Portland Marathon in 4 hours, 15 minutes and 29 seconds!! I’d like to introduce myself to those of you who do not already know me. I have been the invisible person in the area since I accepted a job with the University of Oregon in the Institute of Neuroscience almost 5 years ago. My weekdays are filled with my job and my weekends are spent trying to get my house and yard in shape…you know, the usual stuff…dishes, laundry, dust, clutter, etc. that accumulates throughout the week. My husband, Jim, and I have lived in the area since 1966. We’ve raised our four kids here and each of them attended the Lorane and Crow schools. We’ve lived in the same house on Lorane Highway, a mile north of Gillespie Corners, all of that time except for a one year period when we rented it out while Jim was working in Corvallis. Our children are all grown now. We have a son and four daughters (that’s a story in itself) and seven grandchildren. We own the Lorane Family Store which we bought in 1977 from the Mitchell family. I ran it for the first 8 years while Jim managed several of the Mayfair Markets in the area. When Mayfair sold their Oregon stores, Jim took a part time position as a meat cutter at the West-Lane Thriftway, and gradually began taking over the management of LFS. When he resigned from the Thriftway position and I found myself demoted to the position of janitor at the store, I began looking for a more challenging position elsewhere. That’s when I accepted a job as secretary for the Institute of Neuroscience at the University of Oregon. It’s a great job and I love it, but I miss my friends and acquaintances in Lorane. I’m hoping that this project will at least allow me to keep in touch and to get to know all of the new people who have moved into the area whom I have not yet met. On March 12, 1883, in Lane County, my great great grandfather, Alexander Fenwick, died and was subsequently buried in the Lorane Grange Cemetery in that county. I have been unable to find very much information about Alexander and was hoping that your records might shed some light on him. All I know is that he was a farmer and that he came to Oregon around 1865. I believe he lived in Lane County near Siuslaw most of the time. I would truly appreciate whatever information you might have on him and would be more than happy to reimburse you for time and materials. Thank you for your attention to my plea. John Cryslerman Simpson was married to Jane S. Coulson in Lorane on November 21, 1861. He was buried in Lorane. Thatcher house on South Territorial Road was built by Milo B. Stone who finished it in 1907. Milo and Ella Stone occupied the house until 1910. In March of this year, a new business was born in the Lorane area. 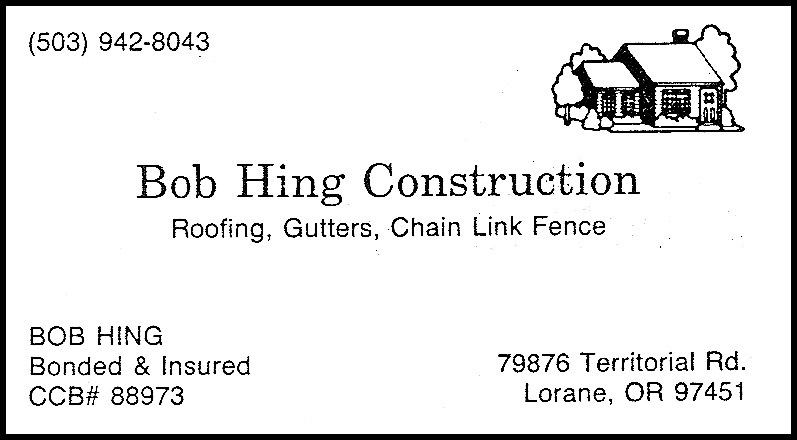 One of Lorane’s long-time residents, Bob Hing, established his own construction company, called, appropriately enough, the Bob Hing Construction. It is located in his home at 79876 Territorial Road in Lorane, and it specializes in roofing, gutters, chain-link fencing, and miscellaneous construction. Bob brings to the company his 27 years experience working for Sears Roebuck & Co. When his job at Sears was eliminated, Bob decided to form his own business using the same installers that he had worked with for the past 15 years. The fence installer also does first quality work and happens to be a brother to the roofer. In the 15 years that Bob has worked with these men, there have been no complaints from their customers. Bob assures us that his prices are very competitive to those in both Eugene and Cottage Grove. “We are not the cheapest, or are we the most expensive.” No one does better quality work, as their very satisfied customers can attest. Remember the marvelous, romantic scenes in the old war movies where, with the threat of war brewing, the hero was drafted into the military and on the eve of his getting shipped overseas, the couple scrapped their formal wedding plans in order to get married before he left to fight for his country? Well, Joe and Barbara (Ostberg) Brewer, with a couple of changes in the script, managed to live those scenes. The date was December 3, 1951, and the war was the Korean conflict, already in progress. Joe was drafted into the Army on January 3, 1951, and following basic training, he and Barbara became engaged. Soon after, while she was visiting him in Las Cruces, New Mexico, and fearing that he would soon be “shipped out”, they decided to get married before she returned home to Coos Bay, Oregon. As soon as they were able to obtain a license, they“rousted out” the minister of a local Christian Church and were married. In less than 3 weeks after Barbara’s return home, Joe was on his way to Korea to serve with the Korean Military Advisory Group (KMAG). He spent a full year there, bringing home the regulation hair cut that distinguished the South Koreans and Americans from the North Koreans. It became Joe’s trademark. Upon Joe’s return, he and Barbara made their home in Creswell while Joe went to work for Orchard Auto Parts in Eugene and Barbara worked for Gunderson Trucking doing inventory work. In 1963, after several moves coinciding with the births of their four children, they decided to seek a permanent home in the country where their children, Cheryl (Cheri), Teresa (Terri), Jeff, and Sandra, could grow in a healthy environment. They traded their town property for a home and 65 acres belonging to Arnold Kast where Mike and Linda Jenks presently live. They then bought a 155-acre ranch from Harold Gates, later purchasing an additional 55 acres from Eldon Thompson. This, their present home on Gowdyville Road, was built by George Schneider. According to Barbara, “we found a newspaper dated 1887 underneath some wallpaper. The front half of the house is the original part. We don’t know when the back half was added. Two back additions that were attached were offices from the Skelton-Mitchell Mill which were dragged here on skids.” Other families who have lived in the house are: Joseph Schneider (1906-1920), Ernest Theuerkauf (mid-1930’s), Terry McCornack (early 1940’s), Paul Estergard, Ned Pasco, and Harold Gates. Soon after their arrival in Lorane, Lucille Mitchell asked them if they would allow their children to attend the Lorane Church’s Vacation Bible School. When the minister, Mr. Flemming, brought the kids home following their first day, he noticed Barbara’s piano. When he discovered that she played, he asked her if she would be willing to fill in for his wife as the Church’s accompanist when they went on vacation. Barbara agreed, and soon afterward, the Flemmings moved and Barbara has been playing the piano at the Church ever since, sometimes trading Sundays with the wives of some of its pastors. Barbara relates, “we have been very happy with our choice of Lorane. The people have been very friendly and helpful. Some of the first people I recall meeting when we first arrived were Eldon Thompson and Oren Jacobson who were at our house several times helping during a flue or smoke scare.” And then there was Grace Thompson who supplied them with fresh milk and Hester Briggs who had fresh eggs to sell. Grace invited them to join the Lorane Grange. They were eager to meet others in the community and to belong to an organization that the whole family could attend and were soon participating members. They are still active in the organization. Eldon Thompson was very helpful in advising them with veterinary and farm problems, even helping occasionally to pull calves having problems being born. He baled their hay until they obtained their own equipment. “This community always pulls together when there is a need. You can get as involved as you want here in a variety of causes.” Their present neighbors include Vergil and Linda Hughes, Duane Coop, Russ and Alice Pellham, Frank Cataldo, and Bernard and Donna Moulton. 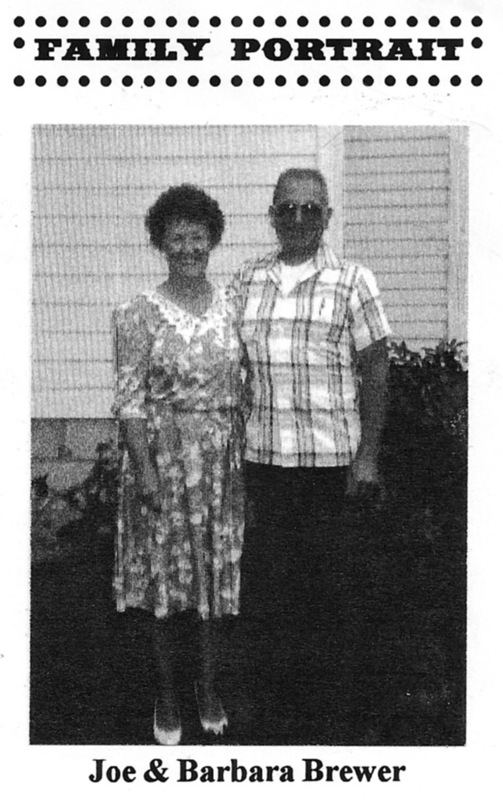 Joe, who is Lorane’s present Fire Chief, was involved early in life as a volunteer firefighter for the Marshfield Fire Department when he first met Barbara. Their concern for Lorane’s lack of fire and medical protection led them to join with others in forming the Lorane Volunteer and Emergency Fire Group in 1973. Several volunteered to take training as First Responders from the Crow Fire Department. Joe has kept up on his recertification in order to retain his First Responder level and Barbara has become an EMT I (Emergency Medical Technician). They both feel that it is very satisfying to know that all of the time and work that they put into training and practice has made a positive difference in the safety of the community. In 1982, when the community voted to establish the Lorane Fire Department, Joe was one of its first board members along with Bruce McDonald, Larry Wilson, Walt Hayes, and Earl Kuskie. Carl Wilson was the first Fire Chief, followed by Joe. Joe retired after 34 years with Roberts Motor Co., Inc. in Eugene. He and Barbara have 9 grandchildren including Tyler, Lindsey, Nichole, and Gregory Wilson; John and Christina Lay; Travis and Lacee Brewer; and Jessica Newton. Joe and Barbara enjoy camping and fishing in the Central Oregon lakes. They’ve travelled to British Columbia and Alberta, Canada, and most recently, spent a week in Hawaii. Their hobbies differ in that Joe likes to elk hunt and collect caps. Music is Barbara’s favorite hobby, although she has recently begun collecting plates. Their entertainment centers around family (“observing our grandchildren is sometimes great entertainment!”), and an occasional night out at the Hult Center is high on their list. They both agree that the happiest events of their lives were their wedding, Joe’s return from Korea, and the births of their children. The most traumatic for both was receiving the news that Barbara had a malignant breast tumor. They have faced the storms of their life in the same way that they have delighted in the sunshine…together. They each credit Barbara’s continuing “clean bill of health” to their positive attitudes and the prayers and support of all of those who offered them, and, most of all, their abundant faith in God. With the proverbial “tongue in cheek”, Barbara stated that the next most traumatic event in their lives was the announcement of a pending farm audit from the IRS. The Brewers’ sense of humor, friendliness, and willingness to contribute to their community have gained them a respect and a permanent place in the history of the area and in the hearts of the community. Scott and Diana have two children, Danielle, age 5, and Zachary, age 17 mos. Danielle enrolled in Mrs. Smith-Edwards’ Lorane Elementary kindergarten class in September. Scott is a terminal manager for Advocate Service, a truck repair shop in Springfield. He received his training through the diesel mechanics program at Lane Community College. Diana worked for 5 years in retail management before becoming a full time homemaker following the birth of Danielle. 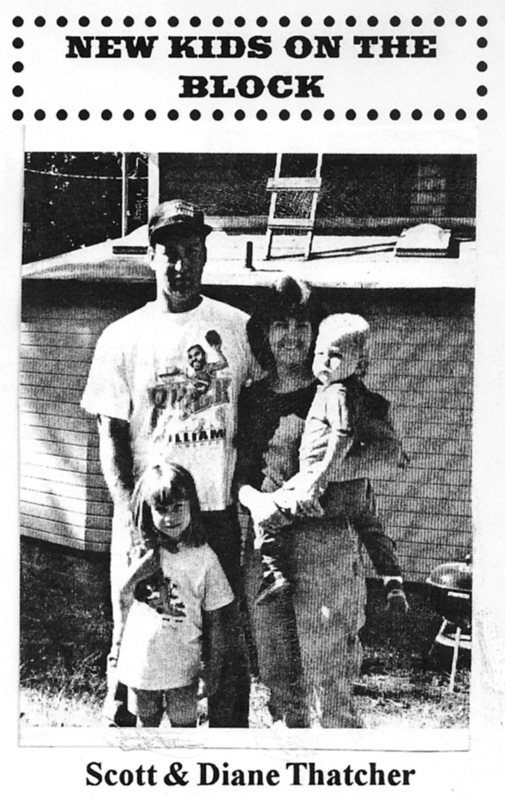 Scott grew up in Crow with his parents, Don and Loretta Thatcher, and brothers, Shawn and Shannon. Diana spent her high school years in the McKenzie River area. The Thatchers are both looking forward to meeting more people in the area. They were acquainted with the Himmels before moving to Lorane, as Scott and Jim work together, but haven’t had the opportunity, as yet, to get to know their other neighbors well. Scott and Diana both love to water ski and spend a lot of recreation time with their friends and family. When she has time, Diana admits “ I love to bake for my family and try out new recipes, especially around the holidays.” She also makes craft items for holiday bazaars. Both Scott and Diana admit that they don’t know how long they will stay in Lorane because their dream has always been to live in Eastern Oregon near Scott’s family. His parents and brother, Shawn, live and ranch there. I’m interested in early Andrew Doak history. My family is the Walling’s. Can somene of this line email me please. Hello Patti… I do not have contact information on any of the Andrew Doak descendants. I do have a short portion on the Andrew Doak family in my book, From Sawdust and Cider to Wine, but most of it is census information. I did not have any input from the family itself to include in the book, but there is mention of various Doak family members in the school and the I.O.O.F. Lodge sections of the book.